This latest sonic offering from the journeyman songsmith Brad Byrd is somewhat middle of the road in places, but has charm, and moments of soaring brilliance. 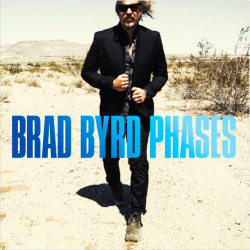 Describing his music as somewhere between indie-rock and alt-country, California resident Byrd has been writing songs his whole life, and that certainly comes through in the polished sound of ‘Phases‘, which is an album of self-examination. The songs take us all the way from Byrd’s childhood in Massachusetts to the sun-soaked hills of California where he lives today, exploring a number of elements drawn from personal experience. Overall, it’s a record which documents the ups and downs of life, and the strange melancholy experienced when reminiscing about a long lost past. The album reflects this yearning in its wonderful production. There is so much space here, and it almost sounds like a stadium rock record in places. It has classic U2 vibes, and the sad reverb drenched expanses of R.E.M. seep through it, too. Everything on the record sounds great: the guitars, the drums, and the vocals, which at times soar above the mix, and at others gurgle below it with a Cash-esque boom. Overall, it is a highly satisfying listen. There’s plenty here to enjoy: driving bass lines, catchy choruses and sparkly production abounds, but there is that creeping sense that we’ve heard it all before. It’s good fun, but it’s not pushing any boundaries, and perhaps plays it a bit too safe to create any lasting buzz. That being said, what it does it does very well. Lovely production and accomplished songwriting. Certainly worth a listen.